Create a single- or multiple-line form field. A form field creates a single- or multiple-line text or password field, which you can use in a form. You can toggle between single- and multiple-line variations. On the editor canvas, you can double-click the component to edit its placeholder text. The component-specific properties are described below. Refer to Common Properties for descriptions of the common properties. Placeholder Text Text that appears in the field when there is user-entered text. This is commonly used for instructional text. Default Value Default text for the field. Max Length * Maximum number of characters that can be typed into the field. Leave this field blank to allow an unlimited amount of text. Hide Typing * Whether to mask the text in the field with bullets (•), rather than show the actual characters. This is useful for creating a password-entry field. Enabled Whether the field is enabled. A disabled field cannot be clicked. 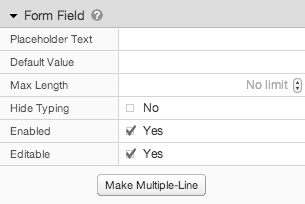 Editable Whether the field is editable. The contents of a read-only field cannot be edited by the user. * These settings are only available for single-line fields.